Enjoy this classic cartoon based farm yard themed scratch card game and reveal the animal behind each barnyard door. Don’t be the black sheep of the family and try your hand at Barn Ville and you could be in with the chance of winning 10,000 times your original stake. PariPlay have been coming up with innovative slots gaming experiences, priding themselves on their ability to offer entertainment at its highest level. To stand out, their developers started creating different online casino games, called online scratch cards, and Barn Ville is one of them. Take on the simple and rewarding life of a farmer and tend to your animals on this clever and easy-to-play game, matching them to win. Who said you can’t have fun on the farm? easyslots.com work very closely with Pariplay to ensure all the best games are available on this site. The sun is shining and all the domesticated cheerful animals inside the barn can’t wait to get out and give you your rewards. The funny 3D graphics will surely make you smile, as you match donkeys, chickens, pigs and much more. On the side of the classic red barn with 3 column and 3 rows, a silo stands tall to remind you of all the ways in which you can win. So grab your farmer’s straw hat and your overalls and start betting from 0.50 to 10.00 per ticket. In an online scratch cards like Barn Ville, you first buy a ticket, which is represented by the barn with 9 doors. Then the sun rises and the animals are ready to peek through the doors. You can click on every individual door yourself, keeping the suspense up until the very last one to see the final result, or if you find that tedious, and you’re fonder of fast action, you can just click on the “show all” button and all will be revealed at once, making it a fun and quick experience. It’s quite easy to win, as all you have to do is get 3 animals of one kind on the same ticket. The prizes range from 10 credits for the chickens, to 100.000 credits for the black horses. Those sure are some valuable horses! The gameplay is straight-forward and the design is user friendly, so you won’t get lost among all the buttons. Each animal makes its own signature noise when revealed behind a door, and their drawing style is quite amusing, while the background sounds really make you feel like you’re out in nature, while birds are chirping in the early morning. If you’re on the go, Barn Ville can be played on mobile at any time, as the graphics are modified to match smaller screens as well. Generally, casino scratch card games are more appropriate for players who want a quick win, while still having the chance to collect big cash prizes. Barn Ville is the perfect experience for that, and it will keep you smiling all throughout. So start playing and enjoy the simple life alongside the barn animals, while enjoying the adrenaline rush that comes with scratching the ticket and finding a match. Join today to get free slots with free spins. 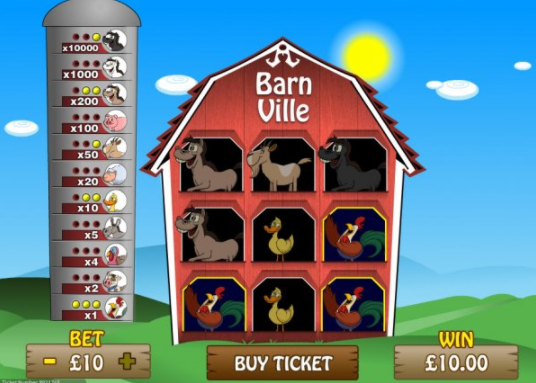 Barn Ville impresses with the simple, yet fun graphics and theme, and you won’t be able to get enough of the thrill of revealing the ticket, always hanging on to the hope that you could win the grand prize of 100.000 coins. An equally adventurous game is our Sugar Train slots game, visit here!